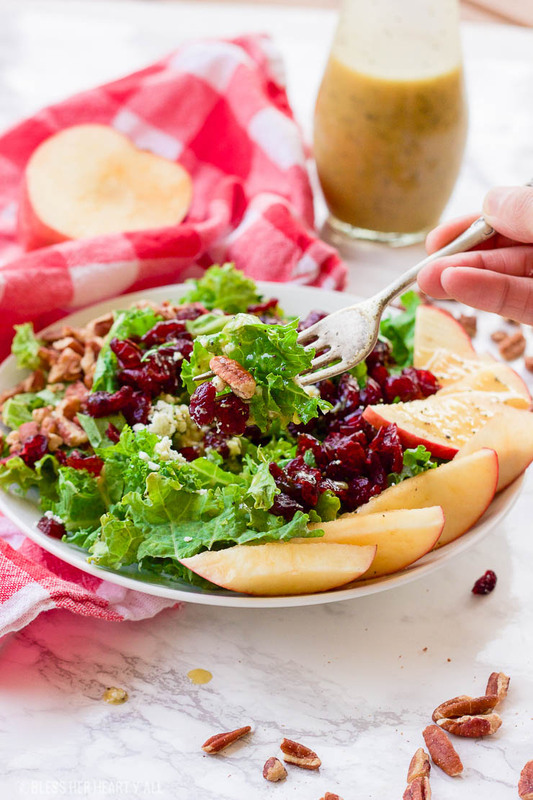 This apple cider poppyseed salad tosses the season’s best combination of juicy apples, crunchy pecans, sweet cranberries, and savory blue cheese crumbles over a bed of chopped kale and drizzles on a 2-minute apple cider poppyseed vinaigrette. It’s big on nutrients and fall flavors and is gluten-free and paleo-friendly! With everything having to do with the holidays right now, my stomach is already in peak performance for digesting all things unhealthy. I’ve already had tons of unhealthy but oh-so-delicious practice. I have been in the kitchen creating holiday foods both for BHHY and for other food clients and brands. Let’s just say that you may see a recipe for a paleo sweet potato pie on BHHY real soon…. but did you know that that pie is likely the second or third sweet potato pie I made for the upcoming recipe? Some recipes flop, sometimes pictures don’t turn out, and sometimes after too much time pondering, I want one little spice tweaked before the recipe is perfect. Oh yeah… or my pie cutting skills are a bust and I mess up the whole thing. Because that JUST happened. Then I have a panel of taste testers to test the creations. Alex the hubby is the most influential, while Pippy and Thelma (the fur babes) have never complained about their taste testing duties nor a dish offered to them. Sooooo… I may be a little worried about my waistline this year…. but everything in moderation right?!? I keep telling myself that and my definition of “moderation” keeps expanding with my waistline. I’ll get it under control shortly. I just need some healthy players in my diet right now and throughout the holiday season. That’s why I decided to play around with some new fall salads in the midst of all the sugary and savory deliciousness around me. 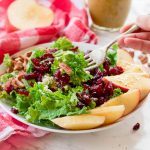 This apple cider poppyseed salad is light and refreshing but still filling enough for a crisp fall evening. Alex and I sat around our living room fireplace and had big bowls of this salad for dinner the other night. It was simply perfect. 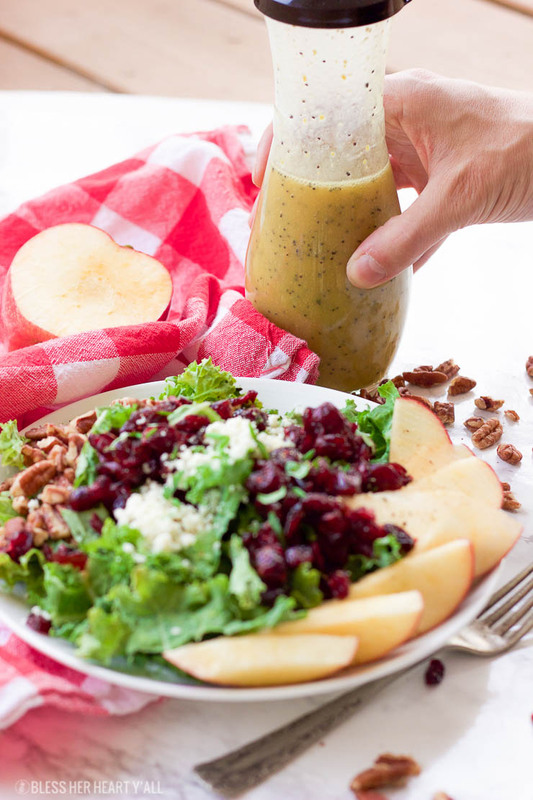 The apple cider vinaigrette perfectly coats the nutrient-dense kale. 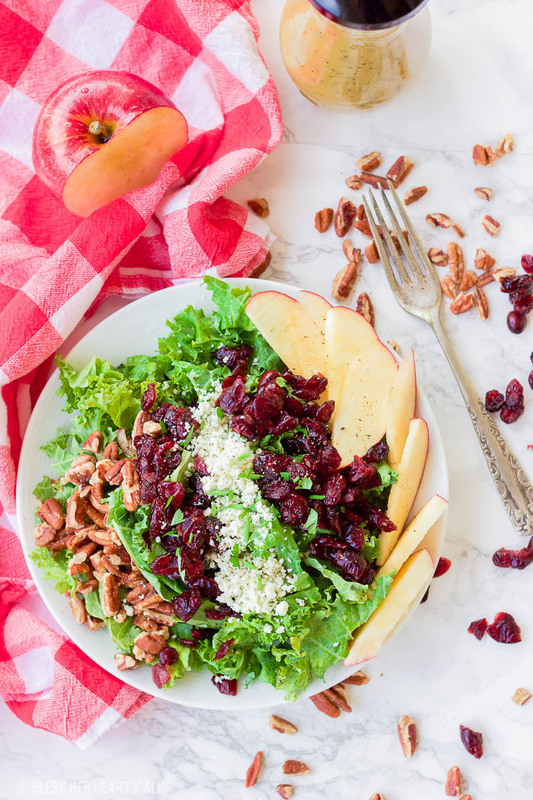 The pecans and apple slices add to the crisp kale’s crunch and the sprinkle of goat cheese adds a savory bite at the end. Mmmmmmmm! It’s pure fall pleasantries right here y’all! 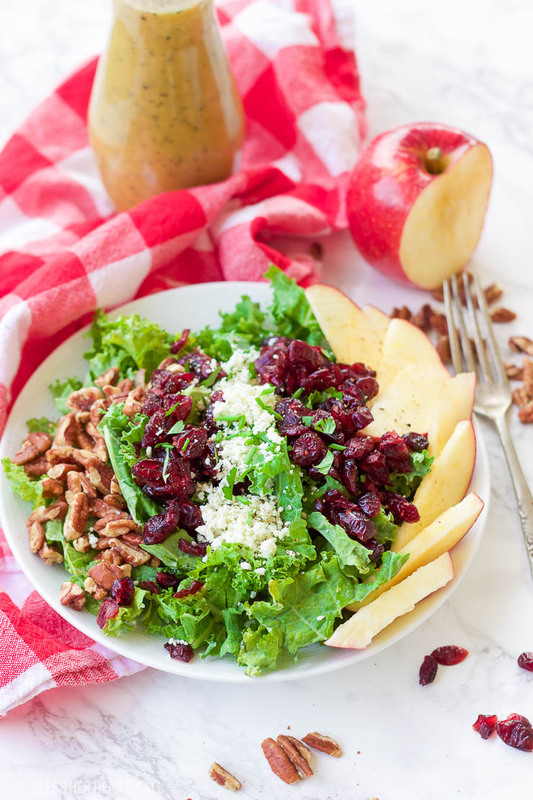 This apple cider poppyseed salad throws the season's best combination of juicy apples, crunchy pecans, sweet cranberries, and savory blue cheese crumbles over a bed of chopped kale and drizzles on a 2-minute apple cider poppyseed vinaigrette. It's big on nutrients and fall flavors and is gluten-free and paleo-friendly! Mix the salad dressing ingredients together by hand or electric mixer. 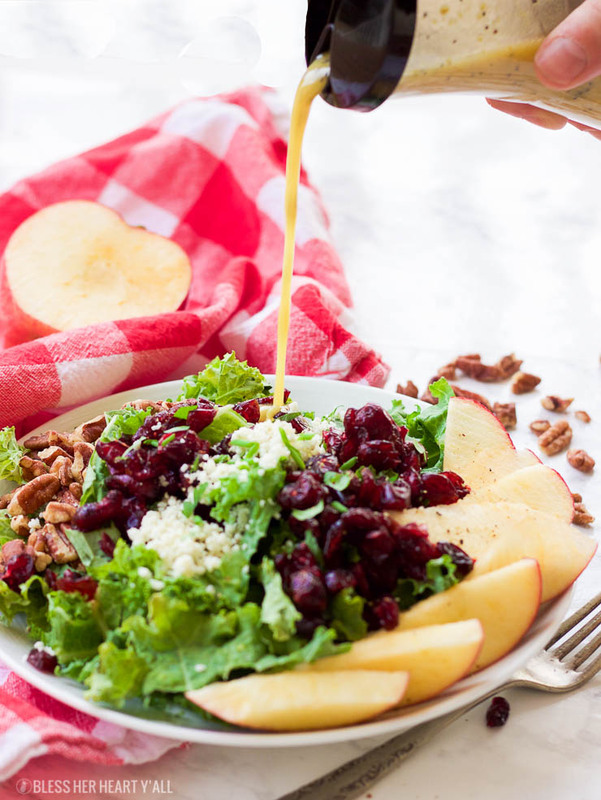 Combine all other ingredients in a large serving bowl and drizzle on the dressing. Enjoy! If you would like to make it a dairy-free or paleo dish, simply omit the blue cheese crumbles. And if you want to make even less of a mess with dishes, use a salad dressing shaker (affiliate link) to place all of your salad dressing ingredients in and then simply shake it up like I did. Now you have only ONE thing to clean, the bottle that the dressing was both mixed and stored in! The dressing stores well in the refrigerator in an airtight container. Now all I need is some orange fall leaves crinkling underneath my feet as I walk sweater-wrapped with my apple cider poppyseed salad bowl off into the warm fall sunset. And that’s when I wake up. No more daydreaming…. back to work, traffic, and work again. BUT the salad isn’t a dream (thank the lawd!). I’m bound and determined to keep my waistline from growing as much as possible and I think this salad is going to be my go-to to keep me sane and on track.